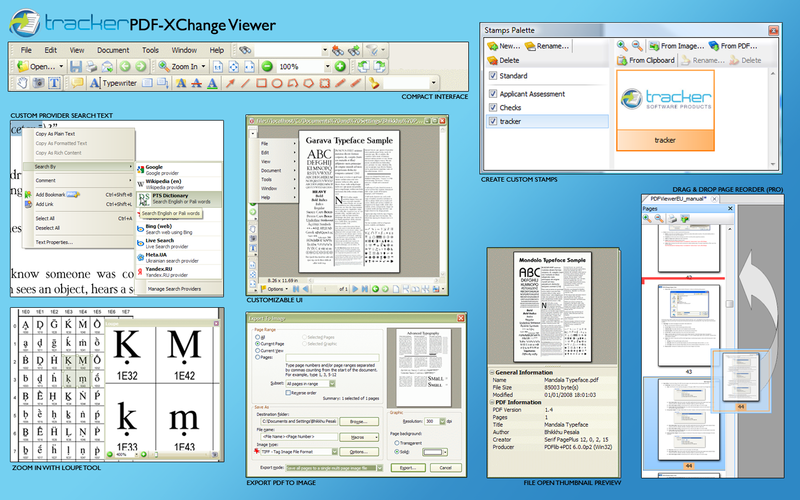 The PDF-XChange Viewer has been discontinued and replaced by the PDF-XChange Editor which is now available including all the features of the Viewer and much, much more. . . The No.1 rated BEST PDF Reader - as voted by Life Hacker Readers by a 2-1 margin for the 2nd year in a row! Those wishing to View/Modify or perform simple editing and even OCR Image based PDF files on their Windows PC's now have a FREE PDF reader alternative to the Adobe Reader! The PDF-XChange Viewer is smaller, faster and more feature rich than any other FREE PDF Reader/ PDF Viewer/ PDF Editor available. This free PDF viewer download also allows users to try the extended functionality offered by the PDF-XChange Viewer 'PRO' in evaluation mode - for free. No PDF reader or Viewer offers more features than PDF-XChange - or does so without compromising performance and quality, checkout the feature list below and save $100's in unnecessary expenditure on your PDF software today. Also included are the very powerful PDF-XChange Shell Extensions and iFilter. The FREE OCR functionality supports a base language set of English, French, German & Spanish. Additional Language Extension Packages are available here. 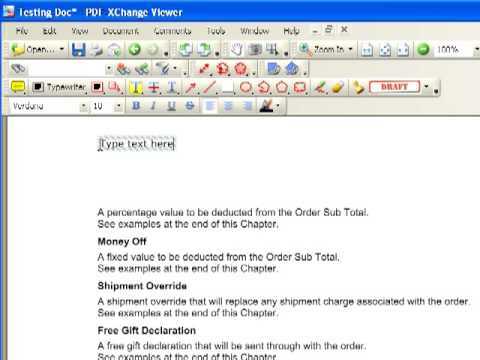 The FREE PDF viewer download of the PDF-XChange Viewer may be used without limitation for Private, Commercial, Government and all uses, provided it is not -: incorporated or distributed for profit/commercial gain with other software or media distribution of any type - without first gaining permission. A Software Developers Viewer SDK is available including for licensing in 3rd party software applications that require the functionality of a PDF reader, or the ability to edit PDF files from within their own applications, without exorbitant royalty fees. 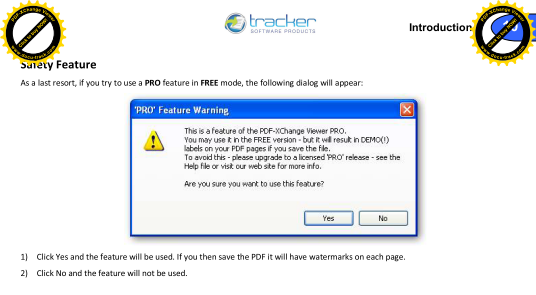 Note: For those users that would still like to use the licensed "PRO" version of PDF-XChange Viewer, the Serial keys for PDF-XChange Editor, PDF-Tools and PDF-XChange Pro are compatible for directly unlocking the "Pro" features of the Viewer. New - OCR options included - OCR your image based/scanned PDF's to make fully text searchable PDF files !!!! Data Execution Prevention (DEP) - stops the execution of nefarious scripts from Virus's/trojans etc. Fill and Save Adobe Forms to disk, email or 'post' - including XFA and dynamic forms (new in V2.5) ! Integrate seamlessly with your favorite translation software to translate text on the 'fly' - including : ABBYY Lingvo 12, Translate It!, Lingoes. Document Search. Probably the fastest PDF document search engine available today ! IFilter Fast Search ! Trackers super fast IFilter is supplied FREE with all PDF-XChange Viewer installs and extracts and searches text from pages, document info (title, authors, subject etc. ), comments, and bookmarks etc - faster than any competing IFilter product available! Portable version also available - can be run from any suitable device such as a Memory stick/CD/DVD etc - simply unzip and use - no installation required - just 6MB download ! 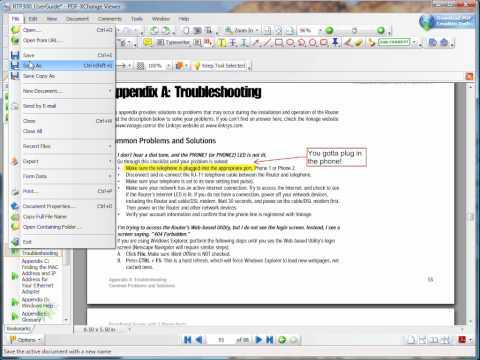 Advanced PRO features - PDF-XChange Editor License Required. 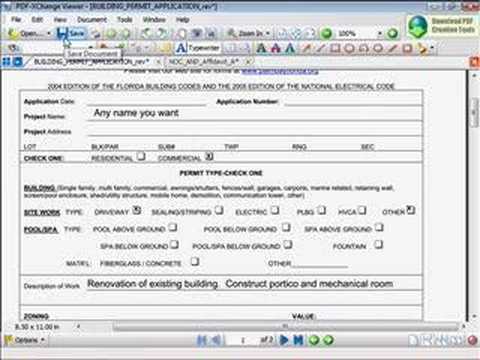 PDF-XChange Viewer offers the simple and advanced user a feature rich annotation library of tools far surpassing the offerings of our competitors, as well as the means to customize each tool. From pop-ups and sticky notes to stamps and auto calculated measurement tools, we know you'll be surprised with what our viewer has to offer. A small sample of just some of the many features PDF-XChange Viewer has to offer. Secure your PDF files and setup document permission options with ease. 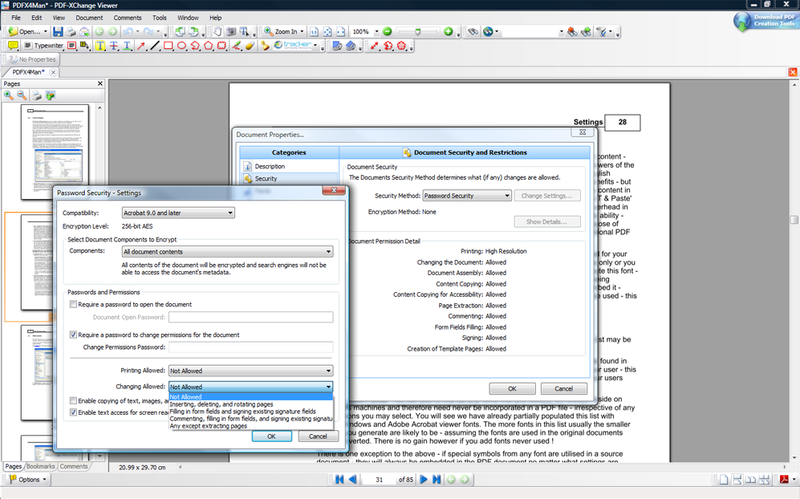 PDF-XChange Viewer allows user to add 40/128 bit RC4 or 128/256 bit AES encryption, as well the PRO version offers Digital Signature support to ensure Document & Content Authenticity. Version 5 (2012): Microsoft/Citrix Terminal Server compatible*. *There are some limitations to product support for Windows XP as Microsoft have stopped supporting it. Further information about this issue is available here. You can try any of the PRO features but, be very careful not to save your PDF if you don't want the watermarks to appear in the upper corners of each page of the document. 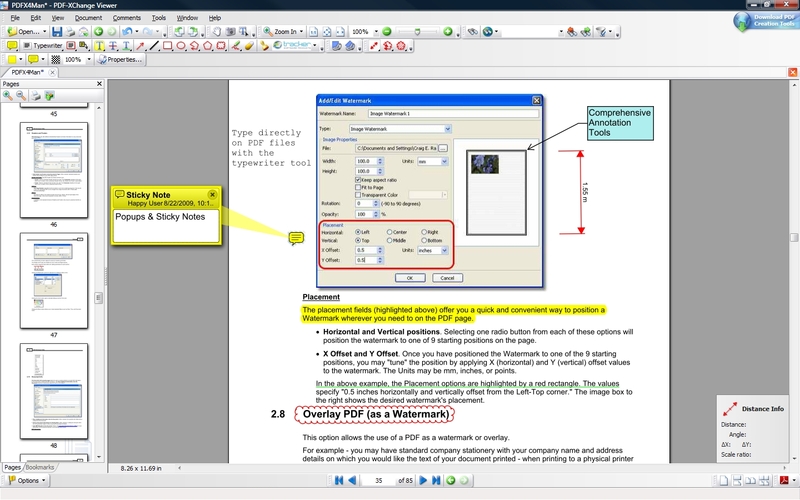 Once a document is watermarked, there is no way to remove them so save a copy of the original PDF before trying the PRO features in an unlicensed Viewer. 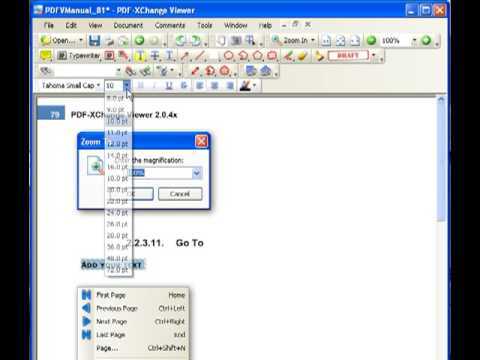 PDF-XChange Viewer Help Manual - To reduce the size of the Viewer installer download file the Help Manual is now a separate download. You can download the Viewer Manual here: Download PDF-XChange Viewer Help Manual. The PDF-XChange Viewer is not designed to create new PDF files from 3rd party document formats such as MS Office, Internet Explorer etc - if you wish to create NEW PDF files from Windows applications (any that can print to paper) then choose one of our Virtual Print drivers below - the PDF-XChange Viewer is designed to create PDF files only from images - or to scan new pages from your scanner - as well as View/Modify/Annotate etc - existing PDF files! We recommend all users who need to ask which version to download - use the exe/zip installers (the only difference is one is wrapped in a zip file as some download management software will block '.exe' files) as this will correctly sense and install for the Windows version you use, MSI installers do not and you must be sure you download the right version - for the operating system your system uses. MSI Installer Options - who should use ? The easiest answer to this is if you are not sure - do not use these installers - they are aimed at corporate system administrators - not general users, so if you are not sure - use the default installer provided and not the MSI installer option !!! If PDF-XChange Viewer build 200 or later has been installed without the OCR Base Languages support, the Base Language Pack will need to be downloaded and installed prior to any other of the available language packs. Very good product, does everything I need for manipulating pdf's. this is the best pdf app i ever come across. I like the free Viewer product but the free Editor does not behave the same as the Free Viewer. The free Editor adds a Demo watermark to all pages for certain types of edits where the Viewer does not add. As Adobe reader most recently have become more bloated and slow than necessary, I turned to other software. PDF-XChange Viewer came highly recommended and after trying it I can now see why. Efficient, fast, appropriate. Much obliged.